Man, these books are addictive! After finishing this book, I can say with certainty that I will be reading this whole (incredibly long) series. I've said it a million times now, but I jut freaking love all the scandal, drama, lies, and secrets in these books. I don't keep up with celebrity gossip (usually) and thankfully my personal life is mostly drama-free, so this series has become my regular source for drama. 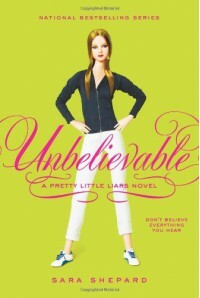 Unbelievable moved a little bit more slowly than some of the other books, but it was still a fun and engaging read. By the end, I was very happy because we FINALLY got some answers. I also really liked how the girls seemed to be getting a little closer in this book. They're starting to confess some of their secrets to each other, which I've been hoping they would start doing for a while now. Yes, admitting you deep dark secrets is scary, but I think it will bring the girls closer together (and I'm rooting for all of them; I honestly don't even have a favorite) and it will help regarding the whole A mystery. Honestly, this book wrapped up many loose ends very nicely. If you would have told me the series ended here, I would have been satisfied. But knowing there are TWELVE more books in this series, obviously the drama is far from over and I kind of need my fix.